Brussels-based Next Kraftwerke Belgium successfully provides primary reserve (R1) to transmission system operator Elia by networking the power generation of many small renewable generators. With its Virtual Power Plant (VPP), Next Kraftwerke brings a new concept to Belgium and is the first to prove that renewables can offer the same demanding system services as large nuclear plants or gas turbines. 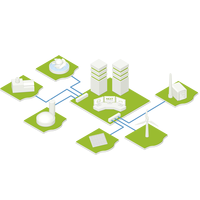 In order to provide control reserve, Next Kraftwerke combines small and medium-sized electricity producers with flexible electricity consumers in a single European-wide Virtual Power Plant. Examples include biogas or combined heat and power (CHP) plants owned by local farmers on the production side, and flexible pumps, ventilators and compressors on the consumption side. This pool of diverse units is monitored in real-time and is automatically controlled by algorithms run in Next Kraftwerke’s control center. All profits coming from successful bids to Elia and the subsequent provision of control reserve are transparently divided among the individual operators and Next Kraftwerke Belgium. Next Kraftwerke is the first company in Belgium to provide primary control on lower voltage levels, showing that renewables are not – as often claimed – a threat to system security. In fact, renewables can support the power system. “Our Virtual Power Plant provides the same grid stabilizing services that were previously delivered by large-scale nuclear and gas plants. We help to safely integrate the large volumes of solar and wind energy that are expected to come online in the coming years, and make an important step towards independence from large-scale central units,” says Next Kraftwerke Belgium’s co-founder and CEO Jan De Decker. Control reserve is contracted by transmission system operators such as Elia to balance the electricity system when power production and consumption are out of sync. Primary reserve is the fastest control reserve product: Within 30 seconds, power generators and consumers automatically react to a signal taken directly from the power grid to increase or decrease power output. Single, decentralized energy producers do not have enough capacity and availability to provide the service alone. Combined with other small-scale power producers, however, the aggregated power production offers enough stability. The result is a single joint power provider that is not unlike a large-scale nuclear plant, but one that does not face as many outages thanks to the higher resiliency of a large number of participants. The Virtual Power Plant was approved by Elia to offer the demanding primary reserve service after undergoing thorough checks that are customary for all plants providing primary reserve. “We are the first to offer these system services with small electricity producing units in a market that has been, until now, nearly completely dominated by Engie and EDF Luminus. We are here to open up the markets and increase competition for the benefit of the end-consumer as we did in Germany. We want to speed up the transformation of the Belgian energy sector,” said Jan De Decker. A virtual power plant is a pool of several decentralized production installations, often including flexible power consumers. Individual decentralized plants can in general not offer services like reserve power or offer their flexibility on the power exchanges as their production or consumption profile varies strongly. They further show insufficient availability due to unforeseen outages or they simply do not meet the minimum bid size of the markets. In addition, there are strict requirements regarding the availability and reliability of the flexibility offered in the market. To overcome these barriers, the solution is simple: work together! The combination of several types of flexible production and consumption units, controlled by a central intelligent system, is the core idea behind a virtual power plant. This way a VPP can deliver the same service and trade on the same markets as large central power plants or industrial consumers.